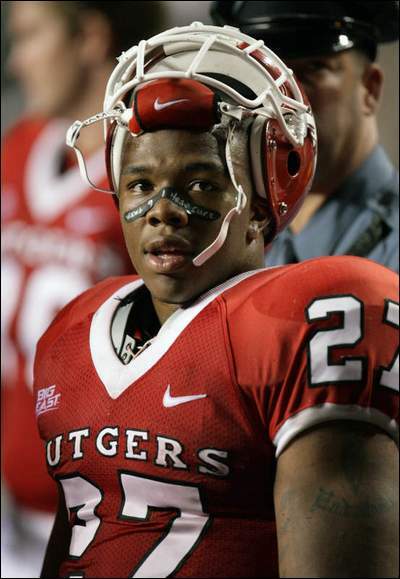 Ray Rice is a junior at Rutgers University and the star running back for their Scarlet Knights football team. He rushed for 290 yards and four touchdowns in their bowl win over Ball State on Saturday and was asked after the game if he would return for his senior season or declare himself eligible for the NFL draft. "Me and coach will sit down once we get back to New Jersey and decide on that," Rice answered. "Me and coach?" This guy is a junior in college with that brain? At least he didn't say he is taking it "one day at a time" or some other overused sports cliche. If he had, he might have earned a mention in columnist Gene Collier's annual Trite Trophy column in the Pittsburgh Post-Gazette. It's become something of a bridesmaid for the Trite, but still gets abused on a daily basis by players and coaches cast as scapegoats in all manner of sports dramas. Why are they throwing him under the bus? I don't know. I wish they'd just blame him. Had a monstrous year because of the Patriots' run at an undefeated season, doable only as a mirrored function of their ability to run the table, sometimes referred to as WIN OUT. Happily enough, New England, in emerging as the team most likely to run the table, also managed to table the run. Oh yeah, I hear that palpable sigh of relief in our audience recognizing that a Threepeat has been averted. It Is What It Is, a hyper-abused construction of astounding meaninglessness, was last year anointed the only two-time winner in Trite history. It Is What It Is remains a near primal force on the sports verbiscape, an almost constant reminder that when you can't think of anything to say, you can always go IIWII. Are You Kiddin' Me? What about Are You Kiddin' Me?? No, They're Very Physical, the veteran cliche used and abused by so many coaches and players, writers, broadcasters, fans and pets over so many years finally gets its moment. Perhaps the most vapid description of any upcoming opponent ever devised, and readily adaptable twaddle for every kind of analyst pretending to know anything about any team in America, They're Very Physical has lived to serve. They're Very Physical is everywhere and in every way completely useless. Well good, because this ain't Jeopardy." Bean, I really like your blog and I'm going to read it "one day at a time". Yeah, Valerie Bertinelli! First and foremost, Ray Rice needs to do what is best for Ray Rice, you know. As long as he gives 110%. You missed the most over used sports cliche of the century: the ever so meaningless, "We have got to execute."